Francesco Canova da Milano (Francesco da Milano, also known as Il divino, was an Italian lutenist and composer. He was born in Monza, near Milan (1497), and worked for the papal court for almost all of his career. Francesco was heralded throughout Europe as the foremost lute composer of his time. More of his music is preserved than of any other lutenist of the period, and his work continued to influence composers for more than a century after his death in 1543. Already by 1530 Francesco’s music was widely known and studied. 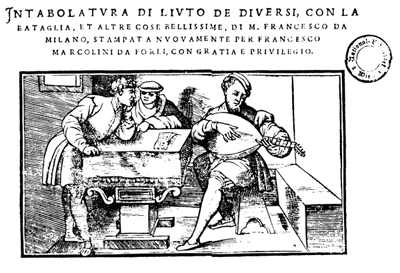 A few of his works were published in France by Pierre Attaingnant in 1529, five volumes of lute music comprising mostly Francesco’s works were published in Milan in 1536. There are many 16th- and 17th-century manuscript sources for his works, as well. Today, more than a hundred ricercars and fantasias (two terms used interchangeably in Francesco’s oeuvre), some 30 intabulations and a few other pieces by Francesco are known. His music represents the transition from the loose improvisational style of his predecessors to the more refined polyphonic textures of later lute music. One of the defining characteristic features of Francesco’s style is the manipulation and development of short melodic motifs within a “narrative” formal outline. Francesco was drawing on techniques found in contemporary vocal music, e.g. works by Josquin des Prez and composers of his generation. Aside from his influence on the development of lute music, he is also important for being among the first composers to create monothematic ricercars. The collected extant lute music of Francesco, edited by Arthur Ness, was published by Harvard University Press in 1970 (ISBN 0-674-53955-9).